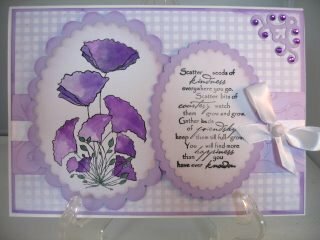 Water Colour Paints, another technique for you to try for soft and gentle effects to your card making. Water colouring is very easy to work with and very forgiving too, and the delicate effect is really good especially if you are new to this medium. If you are stamping out the image to be coloured then make sure that the ink pad is a permanent one otherwise the ink will bleed and spoil the look. 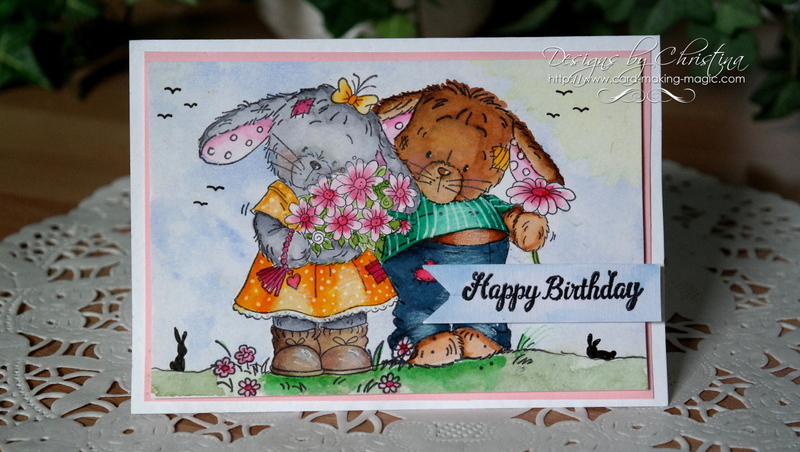 This lovely image is from Clarity Stamp and the same stamp has been used twice to create two cards, but with completely different colours. I have used a water colour card that is 300 gsm, and this will give a stable topper for my finished design. Mat and Layer the image onto some more card once it is dry. The paints can be bought in small pans, or color impregnated paper, and the colour picked up from them with a damp paint brush. If you like to colour while you are out and about then you could try the "Koi" water brushes that are available on the market. These have a reservoir that is connected to the brush and so eliminates the need to carry extra water with you. Squeeze the reservoir gently to get the water flowing to the tip, and clean the tip regularly with tissues as you go along. Some of these paints have mica pigments in them, which give a shimmery effect when dry. Brush markers are useful when colouring in and the water based ones can be used straight from the pen. Promarkers do a really good Aquamarker that gives an excellent result. I prefer to decant some of the colour onto a non-porous surface and pick it up with the paint brush, and then apply it to the image. Just scribble the brush marker over a white tile or even a scrap piece of acetate and use it that way. The same rules apply to this medium as Water Colour Pencils and Copics. Start with your palest colour first and add the darker ones as you go on. It's easier to blend the colours that way. You can always add more colour where needed, but you can't take it away. Water colour paints, or any other medium you may like to try, is such an enjoyable way to spend your time. 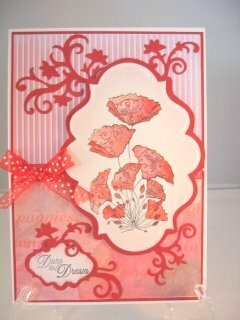 The pictures you create can be incorporated into your cardmaking, for that extra personal touch. Again another idea for you to experiment with and enjoy. For tips and tutorials on how to get the best from this medium have a look at this website.